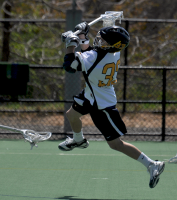 Quinnipiac’s Brendan Wilbur scores a goal in the first quarter of Saturday’s game vs. Bryant. Quinnipiac’s Dylan Webster fights for the ball in the first quarter of Saturday’s game vs. Bryant. Quinnipiac’s Evan Weldon dekes a defender in the first quarter of Saturday’s game vs. Bryant. Quinnipiac’s Chris Messina guards a Bryant player in the first quarter of Saturday’s game vs. Bryant. Quinnipiac’s Dylan Webster tries to pick up a loose ball in the second quarter of Saturday’s game vs. Bryant. Quinnipiac head coach Eric Fekete talks to his team in the second quarter of Saturday’s game vs. Bryant. 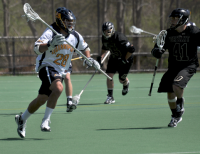 Quinnipiac’s Chris Messina runs down field in the second quarter of Saturday’s game vs. Bryant. Quinnipiac’s Jay Binkowski eludes a defender in the second quarter of Saturday’s game vs. Bryant. Quinnipiac’s Chris Coppolecchia runs down field in the second quarter of Saturday’s game vs. Bryant. Quinnipiac’s Dylan Webster celebrates a goal with Matt Diehl in the second quarter of Saturday’s game vs. Bryant. 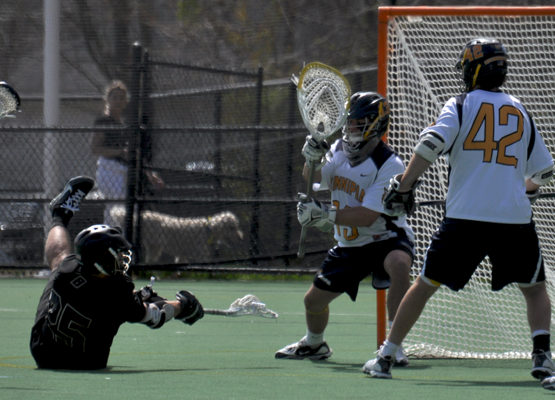 Quinnipiac’s Dylan Torey makes a save in the second quarter of Saturday’s game vs. Bryant. Quinnipiac’s Dylan Torey tries to make a save in the third quarter of Saturday’s game vs. Bryant. 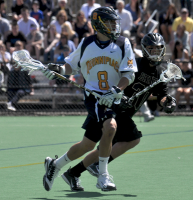 Quinnipiac’s Matt Diehl passes the ball in the third quarter of Saturday’s game vs. Bryant. 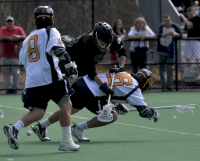 Quinnipiac’s Matt Diehl is hit to the ground in the third quarter of Saturday’s game vs. Bryant. Quinnipiac’s Carmen French kneels to the ground after Bryant scores a goal in the third quarter of Saturday’s game. Quinnipiac’s Brendan Wilbur fights for the ball in the fourth quarter of Saturday’s game vs. Bryant. Quinnipiac’s Dylan Webster is hit in the fourth quarter of Saturday’s game vs. Bryant. Quinnipiac’s Michael Sagl guards a Bryant player in the fourth quarter of Saturday’s game vs. Bryant.